I have said it before and I will say it again. One of the best things about dealing with small, custom gear shops is that they can take on projects that would never happen at larger manufacturers. That is the case with this really slick 10/22 4 Mag Pouch from Triple Stitch Tactical. The pouch features 4 cells designed to hold the Ruger BX-25 10/22 magazines. The pouches have a semi-open bottom design to allow drainage and each cell has individual bungee retention. While the thought of 100 rounds of .22LR on tap in a single pouch warms my heart, this pouch would be great in a single or double cell configuration as well. Check out Triple Stitch Tactical and remember to support the little guys! I am constantly amazed at how the tactical market will come up with pouches for all sorts of obscure military rifles and neglect the one rifle that is probably more prolific than any other. While the 10/22 has a virtually non-existent role in any conflict, there are lotsa folks who just want a good way to carry a buncha mags on a day in the field shooting gophers. 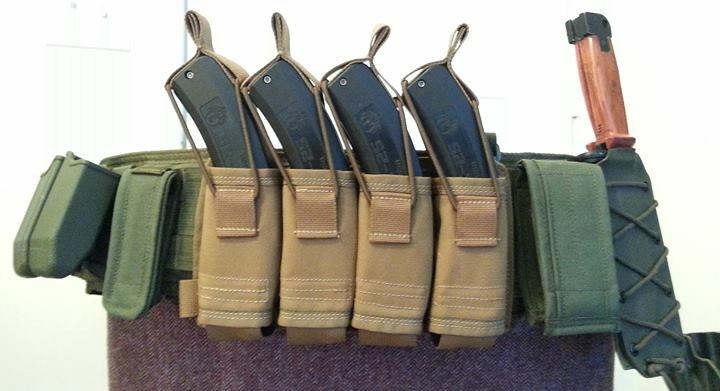 But good luck finding MOLLE/PALS pouches made for 10/22 mags. Darn few out there! Hey Matt thanks for the plug! This one in the pic was a prototype. I’ve made improvements to my design but overall it has all the same great features. I make these pouches for anything from a 10/22 magazine to a FAL magazine, in any mag count configuration. All my designs are driven by the need to fil those gaps left by currently available gear. It doesn’t hurt that I’m a mechanical engineer 😉 I’ll post more pics on my site in the prototype section. Mark….